After a successful first try at teamwork, Spotify and Hulu have united forces once again to offer their (new and old) subscribers a special premium bundle from which you could enjoy the best of both worlds, for just $13 a month. It all started last year when both companies decided to launch an exclusive and fabulous bundle for college students called Spotify Premium for Students, now with Hulu, for just $5 per month, which happens to be an amazing deal since Spotify’s solo student plan alone costs $4.99, so students are practically getting a TV streaming service for free. This partnership received so much positive feedback they have decided to branch out and launch a similar bundle for the rest of the consumers. Consequently, this past April Spotify and Hulu made the official announcement of their new joint promotion, called Spotify Premium, now with Hulu, which is going to be available for (almost) all users. The new bundle started on April 11th and is currently available only to Spotify Premium subscribers, who will have the opportunity, for the first three months, to get access to Hulu’s ad-supported service and only pay 99 extra cents. After the three-month trial is over, the price will go up to $12,99. Luckily, the offer is set to become available to all existing users this summer. 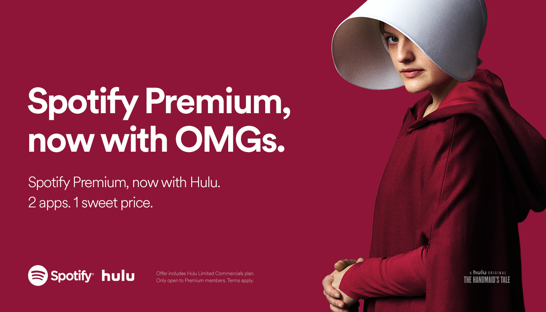 The promotional deal will be limited to only one plan for each platform: Spotify Premium and Hulu Streaming Library, so that means users with a Spotify Premium for Family plan or Hulu No Commercials and/or Hulu with Live TV plans are not eligible. The Spotify Premium plan offers its users the possibility to ceaselessly stream a vast library of more than 35 million tracks and exclusive features such as offline listening mode, better sound quality, Spotify Connect (to sync Spotify with all of your devices) and, of course, ad-free streaming. Furthermore, the Hulu Streaming Plan, although ad-supported, offers access to hundreds of movies and tv shows, including the highly acclaimed Hulu originals The Handmaid’s Tale, The Looming Tower, Marvel’s Runaways, Future Man, The Path, 12.22.63, Casual, among others. Each streaming plan costs $9.99 and $7.99 for Spotify’s and Hulu’s subscription fees, respectively, adding up to $18 per month if you get individual subscriptions. Therefore, in signing up for the Hulu deal, you will get a $5 monthly discount ($60 a year) with all-you-can-stream services with no add commercials, in the case of Spotify, and limited commercials, in the case of Hulu. Another convenient feature of this promotion is that monthly fees will be paid and managed exclusively through Spotify, meaning you’ll only receive one bill instead of two for both services. “Hulu’s TV content is highly acclaimed, and with this exclusive Spotify offer, we are bundling two top media platforms for an unbeatable price. This is just one example of how we can add value to our premium members day after day” said Alex Norstrom, Chief Premium Business Officer at Spotify. Will the Spotify-Hulu bundle get as much popularity, success and high praise as the student bundle did? From the looks of it and the (already) positive reaction to the news, it all leads to a resolute yes.